The Special Reserve White –Roussanne/Marsanne 2012 wine represents two Mediterranean varieties, the Roussanne and Marsanne.The Recanti Winery Special Reserves represents the best of each vintage It is produced in exceptional years only. This special reserve wine represents two Mediterranean varieties, the Roussanne and the Marsanne. Both varieties originate in France. 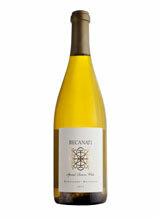 The Roussanne is spicy and the Marsanne is full bodied and together they create a wine that is unique and rich. The grapes have been gently pressed and slowly fermented. The wine was aged for eight months oak barrels. In order to preserve the acidity and fruitiness; it did not go through malolactic fermentation. 6270 bottles of this wonderful Israeli wine have been produced.